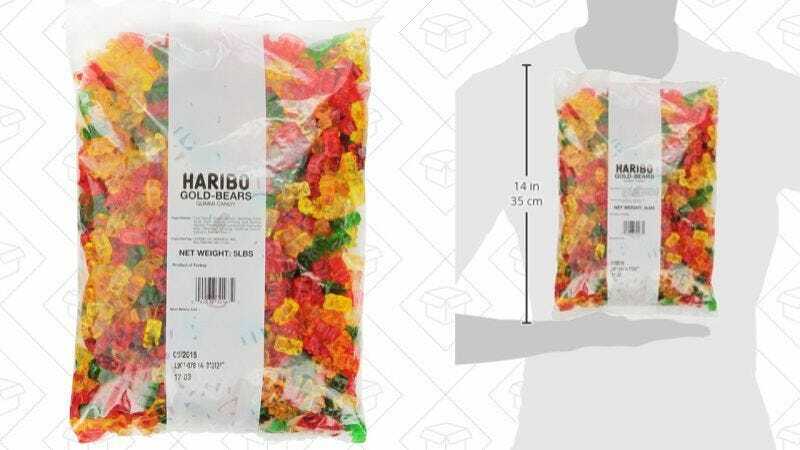 We’ve posted deals on this five-pound bag of Haribo Gold Bears a few times in the past, but this is the first real price drop we’ve seen in 2017, in case you’ve already depleted your stash. You’ll spend $11 if you order it through Amazon’s Subscribe & Save program (you can cancel after your first delivery, but why would you? ), or $12 to get it sooner with Prime shipping. Also, fear not, these aren’t the sugar-free ones that famously do horrible things to you body. “There’s nothing magical about YETI products,” he whispers. Vacuum-insulated stainless steel tumblers are fantastic, don’t get me wrong. They really can keep ice frozen all day long, and they look really cool while doing it. But they’re all basically the exact same thing, so don’t overpay for a brand name. While you’re at it, go ahead and pick up a dozen stainless steel straws for just $10. When you cook with olive oil, you have three choices: You can pour imprecisely, you can make a measuring spoon dirty, or you can use Vremi’s $18 olive oil dispenser, which measures out a precise amount of oil before you pour it. I know which one I would choose. Needless to say, this would also make a great gift for the home cook in your life. Featuring an 8-foot power cord, 11 AC outlets, and two USB ports, this APC surge protector is exactly what you need behind your home theater or office desk. Its current $30 list price would be a match for an all-time low on its own, but the $5 coupon on the page makes this deal even sweeter. Jackery’s Thunder battery packs include Quick Charge 3.0, and both the 10,050mAh and 20,100mAh varieties are marked down today to some of their lowest prices. Just pick your favorite size, and be sure to use the appropriate promo code at checkout. There’s nothing particularly special about this 1080p, 23-inch Dell computer monitor, but if you want to build a multi-monitor setup in your office, $90 is a great price, and this model is VESA-mountable. Today’s deal is actually the first time the price has ever dipped below $110 on Amazon, so don’t miss out. The back of your home theater cabinet doesn’t have to look like a rat king of tangled wires. These velcro sleeves can keep everything tidy, and they even come with adhesive to attach them to the side or bottom of your furniture. Get two 40-inch sleeves for $7 with code 8OG3CJ4J.